The son of NFL Hall of Fame cornerback Deion Sanders has led Trinity Christian to two state titles. All Shedeur Sanders has done since his freshman year at Trinity Christian (Cedar Hill, Texas) is win football games. He's led the Tigers to back-to-back Texas state championships and a 26-1 record during his first two seasons. Sanders has thrown for nearly 5,500 yards and 76 touchdowns during that span and is one of the best high school quarterbacks in the country, regardless of class. 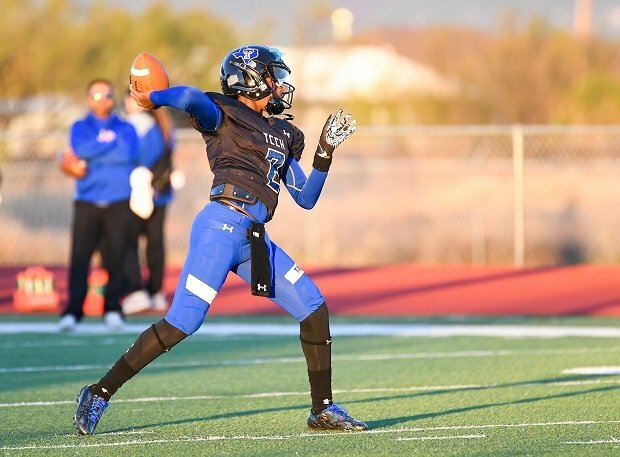 Deion Sanders' son is one of the sauciest quarterbacks in the country. He also happens to be the son of NFL Hall of Fame defensive back Deion "Prime Time" Sanders, the offensive coordinator at Trinity Christian. The father and son have been a big-time connection, lighting up defenses over the last two seasons. The Tigers average 46.5 points per game and have outscored the opposition 1,255-to-399 during that span. Being the son of arguably the best defensive back to ever play, and one of the top professional athletes in sports history, might bring added pressure but that isn't the case with Shedeur Sanders. The rising junior has done a phenomenal job of being himself and creating his own legacy. Sanders has already landed nearly 15 FBS offers led by Georgia, Michigan, LSU and Florida State, his father's alma mater. Expect that number to grow before his junior season is over. Evaluators always saythe tape doesn't lie and in the highlight package above it is easy to see why a lot of big-time colleges want Sanders as their future quarterback. He checks off all the boxes and can make any throw while also being able to extend plays with his legs. He will be the third Sanders to go to an FBS school as Shilo Sanders signed with South Carolina in February and Deion Sanders Jr. went to SMU out of high school. The future is bright for Shedeur Sanders, and there's a good chance he ends his final two years of high school bringing home a couple more state titles. Shedeur Sanders is making a name for himself at Trinity Christian. The son of Deion Sanders, Shedeur has led his team to two TAPPS titles.